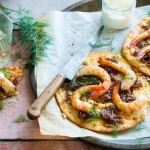 How to make Pita pizza with prawns and caramelised onions (plakous) with Maria Benardis from Greekalicious. The Ancient Egyptians taught the Ancient Greeks bread making and they made many shaped breads including pita bread and other flat breads. They taught these breads many years later to the Ancient Romans who used the Greek flat bread as basis for the dish called pizza. The Ancient Greeks also used flat breads as an alternative to plates. They would place all their food on the pita bread and eat their meal this way. This resembled a pizza without the tomato and cheese base. In addition the Ancient Greeks had a flat bread called “plakous” “plakountos” which was flavored with toppings like herbs, onion, and garlic. This is believed to be the earliest form of pizza. This is not dissimilar to the garlic bread and herbed bread that we know today. Heat the olive oil in a medium-size frying pan over medium-high heat. Add the onions, cover, and cook for 10 minutes. Remove the lid, reduce heat to low and continue to cook, stirring regularly, for 20 minutes until golden. Add the honey, season with salt and pepper and cook, stirring, for 3–4 minutes until caramelised. To serve, place a teaspoon of yoghurt in the centre of each pita and sprinkle over the dill. Serve immediately.